Before Andrew Garfield was locked-in for The Amazing Spider-Man, there was a fan campaign to get Community star Donald Glover cast in the role of Peter Parker. While the actor-turned-rapper lost out on the coveted character, Marvel did go onto create Miles Morales in the comic books, based partially on Donald Glover and President Barack Obama. Now, Donald Glover will voice Miles Morales, who at one point took over for Peter Parker, during Season 3 of Ultimate Spider-Man. Ultimate Spider-Man will return this Sunday for it's season premiere /tv/ultimate-spider-man/Avenging Spider-Man Part 1 and Part 2. 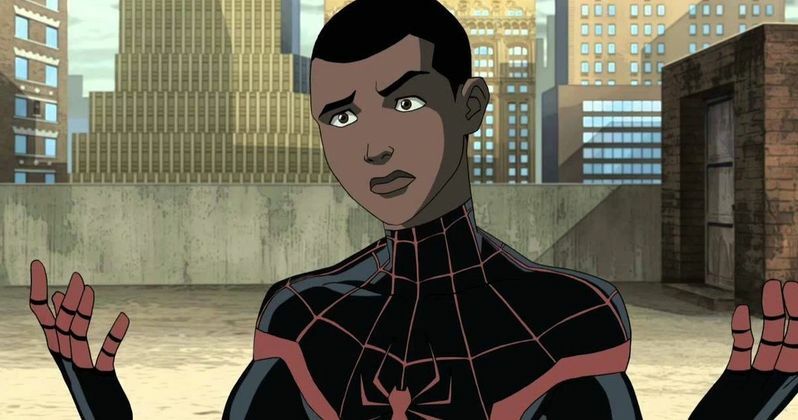 In this latest run of episodes, titled Ultimate Spider-Man: Web Warriors, Peter Parker will travel through various parallel worlds, eventually meeting Miles Morales, a half-black, half-hispanic counterpart who has assumed the role of Spider-Man. "I don't think it's hit me necessarily yet how big of a deal that is, I'm very grateful for that, and it's cool to read the comic now." The actor went onto talk about the responsibility Miles faces as a superhero, and what it means for this young boy to put on the Spider-Man costume. "It's a lot of pressure for a kid to be yourself and have all this responsibility. Miles is really brave, and that's a cool attribute to have when you're that young. I admire anybody who allows themselves to be themselves. Especially a kid. That's the great part about the Spider-Man costume: He can be anybody. Spider-Man could be a girl. Spider-Man could be an old man. You don't know. So I just tried to be as me as possible, because you're always just going to bring it back to yourself when you watch the show. Spider-Man is the best because you just don't know who he is, and he's funny and he's poor. I understand Spider-Man a lot on that level. He's just trying to make it."" The animated series versions of Miles Morales will be very close to the one originated in the comic books. He is still a 13-year-old trying to adjust to his life as a superhero. In Ultimate Spider-Man: Web Warriors, he will team-up with Peter Parker to stop Green Goblin from collecting the DNA of various Spider-Men spread across complex parallel dimensions. We'll even see Spider-Ham at some point in the run. In Miles' world, as it was in the comic books, Peter Parker is dead. So, as you see in the clip above, it comes as a shock to him. "He meets someone who is his hero, and that comes across completely in Donald's performance. He's got a real warmth that suits the character really, really well. If you've read Miles Morales comics, Donald's voice nails what you've been reading. He's a kid you can root for, and you want good things for, who suffered some loss of his own, and we're seeing him come to terms with his new powers and how to use them." Just because Donald Glover is finally voicing the role of Spider-Man, don't think that's the end of this road for the comedian and musician. He still plans on playing the character in the flesh someday. "I still have hopes to do something like that one day. I don't look at this as second place. Spider-Man, he's such an icon - you have to do something with him."